Husqvarna Dirt Bikes, or ‘Huskys’ as they are more commonly known, have a colorful history from the golden era of the 1960s and 70s made famous by the late great Steve McQueen to today’s exceptional ‘Rockstar’ factory racing teams winning motocross and enduro events worldwide. Husqvarna like many motorcycle manufacturers began producing bicycles in the late 19th century, but the company was originally founded in 1689 on the Swedish King’s command for a weapons factory, near the town of Huskvarna in Sweden manufacturing muskets. The logo still depicts their gunsmithing history with the logo form symbolizing the sight over a barrel. The first motorized bicycles were produced in 1903 using imported engines, making Husqvarna the world’s oldest motorcycle manufacturer. It was not until 1918 that Husqvarna began producing its own engines in-house. 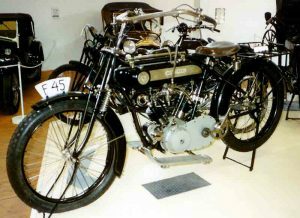 In 1920 Husqvarna’s first engine was a 550cc four-stroke side-valve V-twin engine similar to the Harley Davidson and Indian motorcycles at the time. By 1939 Husqvarna was Sweden’s largest motorcycle manufacturer and was having Grand Prix road racing success in the 350cc and 500cc classes. In 1953 a new form of motorcycle sport became popular in Europe, called moto-cross in Belgium. Husqvarna’s road bikes fast became popular for off-road use. In 1959 Rolf Tibblin rode his 250cc Husqvarna to their first world motocross championship. 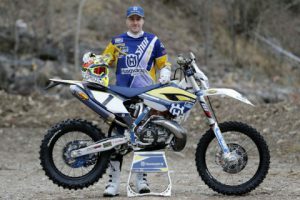 Tibblin won several more world titles with Husqvarna, including ‘Motocross des Nations’ and even Baja 1000 victories. In 1960 Bill Nilsson won the 500cc world motocross title for Husqvarna, beginning a successful big-bore motocross era for Husqvarna. 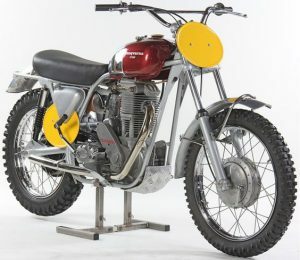 In the 1960s Husqvarna’s two-stroke off-road bikes were a contributing factor in the demise of the once-dominant British four-stroke machines. 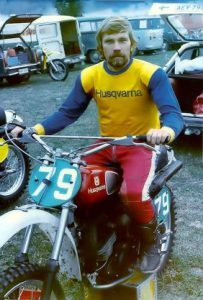 By 1977, dirtbikes had become serious business and one of Sweden’s largest corporations, Electrolux, bought Husqvarna motorcycles. In 1987 the Husqvarna motorcycle division was sold to Italian motorcycle manufacturer Cagiva and became part of MV Agusta Motor S.p.A. ‘Huskies’ were then produced in Varese, Italy. A group of engineers led by Thomas Gustavsson decided to stay back, and formed Husaberg Motor AB in 1988. Husaberg was eventually also purchased by KTM in 1995. Husaberg’s slogan “Ready To Race” was adopted by KTM as its own. In 2007 Husqvarna motorcycles was purchased by BMW. All production remained in Varese and the acquisition was to become the “two-wheeled version of what Mini is to BMW’s car division”. In 2013 BMW sold Husqvarna to the KTM group and Husqvarna’s motorcycle production moved to Mattighofen in Austria. The Husaberg brand was discontinued in 2014 and the technology was absorbed into Husqvarna, marking the reunion of the two halves of the original Husqvarna. 2014 marked the first year of the ‘new-generation’ Huskys, with a return to the classic white, blue and yellow colors. Record sales followed. 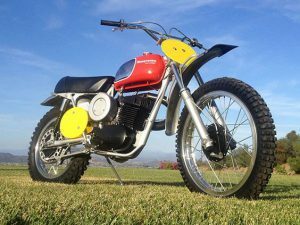 Husqvarna’s golden-age dawned and the brand became a dominant force in motocross and enduros throughout the 1960s and 70s, winning 14 motocross world championships, 24 European Enduro championships and 11 Baja 1000 victories. For more on the Baja 1000, check out my post: Famous Dirt Bike Events. 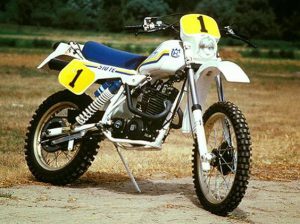 In 1983 Husqvarna unveiled a new 510cc four-stroke enduro bike. It was lightweight, easy handling and became the forerunner for a new generation of four-stroke competition motorcycles in an era that was dominated by two-strokes. Although it had full lights, horn, speedo and was road registerable, don’t be fooled, it was a full-on competition model. By 2008, Husqvarna machines had won more than 70 motocross, Enduro and Supermoto world championships. Since 2015, energy drink Rockstar has been the sponsor of Husqvarna’s off-road factory racing team and they compete in every event of the AMA Supercross and Motocross series. 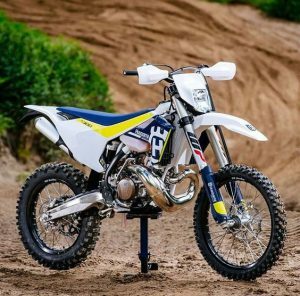 In 2017 Husqvarna motorcycles introduced a fuel injection system to their new range of two-stroke enduro motorcycles. The TPI (Transfer Port Injection) system is a sensor-controlled fuel-efficient technology that conforms with the Euro 4 emission regulations. “Flying Finn” Heikki Mikkola was born in Mikkeli, Finland on July 6, 1945. He was the first Finn to win a world motocross championship. He won his 500cc world championship on a Husqvarna in 1974, taking the title from current world champion Roger De Coster on a Suzuki. In 1976 he won the 250cc world championship, again riding a Husqvarna, and became the first rider to ever win a world motocross championship in both the 250cc and 500cc classes. He signed for the Yamaha team in 1977 and won two more 500cc world championships in 1977 and 1978. He retired from his racing career in 1979 after a fifth-place finish at the age of 34. Extreme Enduro legend Graham Jarvis is a Rockstar Husqvarna Factory Racing Team rider who has just won the 2018 Erzberg Rodeo for his fourth time riding his Husqvarna TE300. For more on Graham Jarvis check out my post: Graham Jarvis Bio. Hollywood’s ‘King Of Cool’ Steve McQueen gave Husqvarna the biggest promotion they could ever have hoped for. Steve was a very competitive racer and rode Huskys to success in many motocross, and enduro events, including the International Six Day Trials (ISDT) and the Baja 1000. 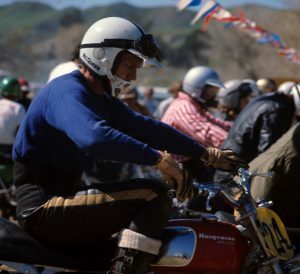 A bike once owned by Steve McQueen can now fetch over $100,000 to a collector. The classic movie ‘On Any Sunday’ featured Steve McQueen, Malcolm Smith, and AMA Grand National champion Mert Lawwill. Have you ever owned a Husky? What is your favorite model? Please feel free to share your thoughts in the comments below.